Candid, or documentary wedding photography is all about capturing little details throughout the wedding day that it's often easy to see past or overlook completely. One wedding photographer in recent times described documentary wedding photography as photographing 'the moments between moments' and this is something that personally, I really relate to. A wedding day is filled with big defining moments. The bride entering the church, the first kiss, the signing of the register etc. And sure, you can fill an entire wedding album with images of these big moment. But for me, it's the small moments between the big moments that make for the best, and most genuine photos of someone's wedding day. The main photo in this article is taken from Andrea and Matt's Warwickshire church wedding, but it's not unique in my work. I really love trying to capture images like this at weddings. These days, wedding ceremonies are quick and can be hectic, so photos like this, showing a moment's peace between the couple are priceless. 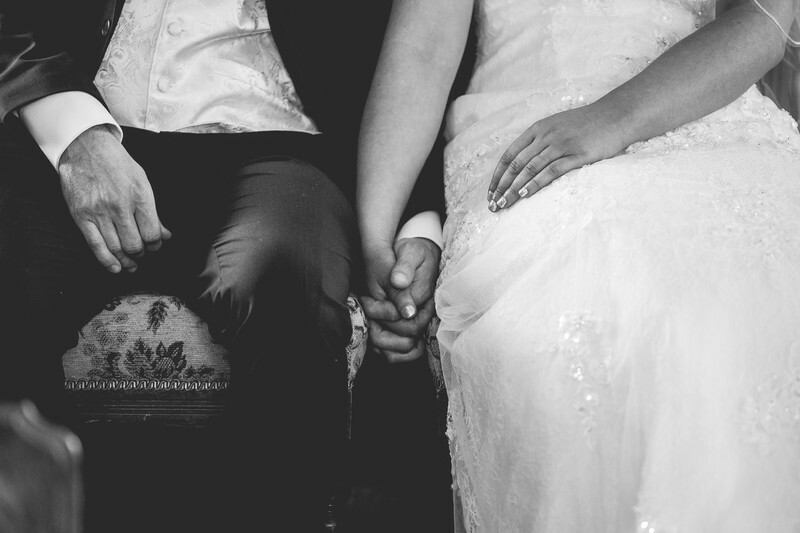 Despite this just being a photo of people's hands, you can use the image itself to work out at what stage of the wedding the photo was taken. The bride and groom are sitting together, but the bride at the time isn't wearing an engagement ring or wedding band on her left hand - If they've exchanged their wedding vows at this point, they haven't yet exchanged wedding rings and would be sitting to hear a reading from the vicar or one of their family or wedding guests. These two photos from another wedding also serve to illustrate why I love these 'moments between moments' - The biggest moments of Kevan and Deb's wedding service was likely to be their first kiss as husband and wife, but the interaction between the bride, groom and young flower girl are just perfect. If I'd gone from photographing big moment to big moment - first kiss to confetti photo - these images wouldn't exist and they're two of my favourite ever wedding photos.